HCL Off Campus Drive in Vijayawada..!!! Hurry Up & Shine Your Career with HCL Company As A Fresher. As per the latest update, all the candidates who had completed Graduation should be 2016 or later can easily grab the best chance to get hired by the HCL team. Moreover, only aspirants belonging to B.E, B.Tech, M.E, M.Tech, MCA, M.Sc streams can directly attend the V R Siddhartha Engineering College Off Campus Drive 2019. All the interested candidates should not lose this chance. Attention B.E, B.Tech, M.E, M.Tech, MCA, M.Sc pass out students to become an HCLite!!! Go soon gathering all the details of the HCL Off Campus Drive 2019 from the below sections. 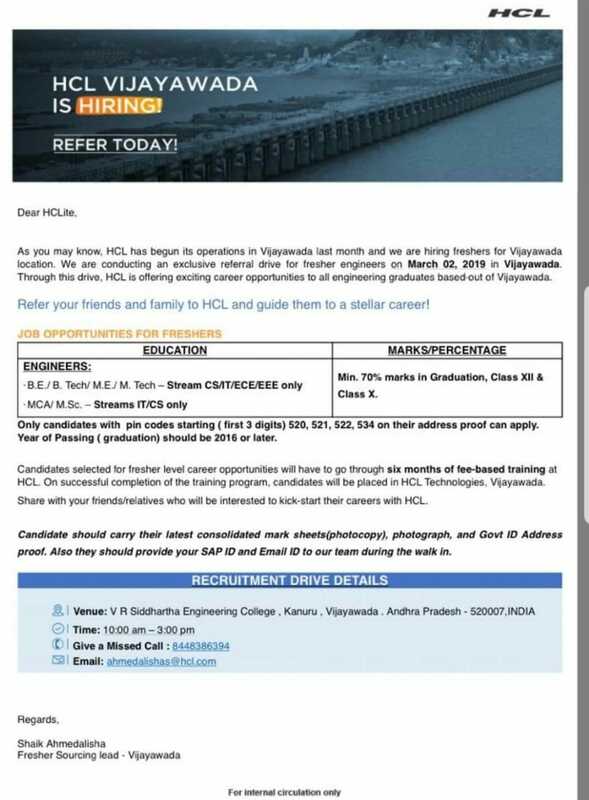 As you may know, HCL has begun its operations in Vijayawada last month and we are hiring freshers for Vijayawada location. And that HCL Off Campus Drive in Vijayawada is going to be conducted on 2nd March 2019 on the scheduled time in V R Siddhartha Engineering College Vijayawada. Also, it will be the best start for all the candidates who are in and around Vijayawada. Candidates who have the passion to work with the HCL Technologies need to check the below given HCL Eligibility Criteria 2019 to attend the HCL Off Campus Drive 2019 in Vijayawada. And through this drive, HCL is offering exciting career opportunities to all engineering graduates based out of Vijayawada. Only candidates with pin codes starting (first 3 digits) 520, 521, 522, 534 on their address proof can apply. Good interpersonal and communication skills – written and verbal. Ability to work in a deadline-oriented group with peak period workflow. Highly proficient in MS Office – Excel, Word, and Outlook. Andhra Pradesh – 520007, India. ★ Candidates selected for fresher level career opportunities will have to go through six months of fee-based training at HCL. On successful completion of the training program, candidates will be placed in HCL Technologies, Vijayawada. Candidates should make a note while attending the HCL Off Campus Drive 2019. That is all the eligible candidates have to carry the below mentioned documents to the V R Siddhartha Engineering College Vijayawada. The photocopy of the Consolidated Mark Sheets is mandatory. And the Govt ID Address proof. Also, they should provide your SAP ID and Email ID. We hope that all of you have got the complete information about the HCL Off Campus Drive in Vijayawada. For more latest off campus drives, you can visit our website Freshers Now on regular basis. We provide genuine walkin and off campus information to job seekers. If you have any doubts then you can use below comments section. We will reply as soon as possible.